His parents were E.S. Luckie and Frances Gatewood. Mr. Luckie married the former Ella Rachel Roberts (1877-1954). Together they rest eternally in this impressive mausoleum. At the time of his death on July 10, 1932, Mr. Luckie resided at 185 Roswell Road and was in the Real Estate business. He died of “organic heart disease.” That seems poetic. The origin of the name “Child Square” is unknown. Researchers think it may be related to graves of orphans. However, there are few children in this section. Buried in this section is the legendary Robert Tyre Jones, Jr. Otherwise known as “Bobby Jones.” Bobby was born to Clara Thomas and Robert Purmedus Jones, a lawyer, on March 17, 1902. Later on he added the “Junior” to his name to honor his father. After trying several different sports, Bobby settled on golf and became a teen phenomenon. At the age of 28, Bobby won the Grand Slam (1930). He immediately retired to enter the legal profession. Having studied at Georgia Tech and Harvard, Bobby studied law at Emory University. In 1924, Bobby married his high school sweetheart, Mary Rice Malone. They had three children: Robert Tyre Jones, III, Clara Jones, and Mary Ellen Jones. Upon retiring, Bobby designed the Augusta National Golf Club and co-founded the Masters Tournament, which has been played in August every year since its inception save one (cancelled because of the war). Bobby died on December 18, 1971. 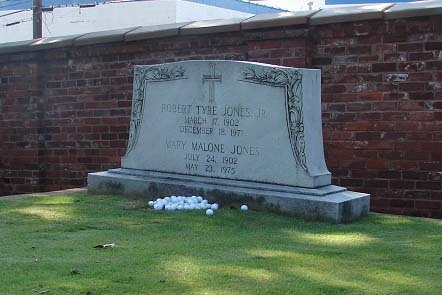 Golfers leave golf balls at the foot of his tomb as a token of their appreciation. 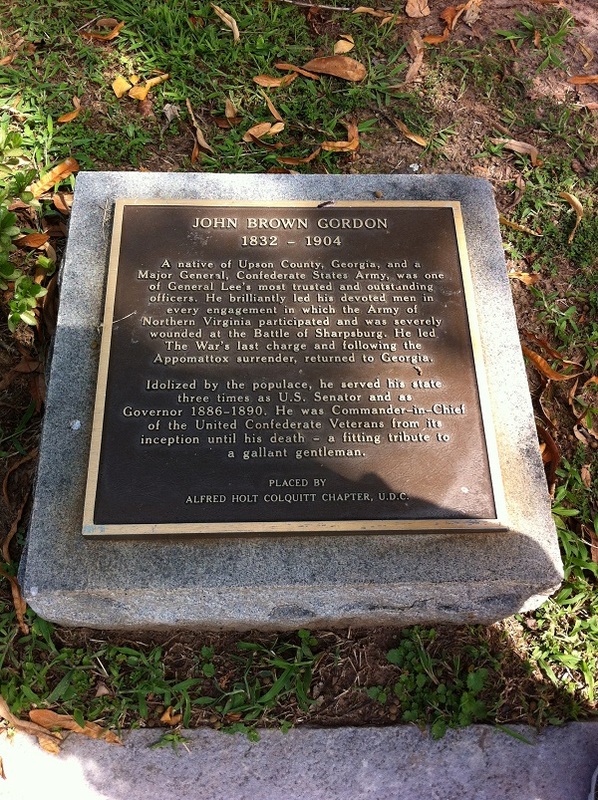 John Brown Gordon was born on February 6, 1832 in Upson County, Georgia. 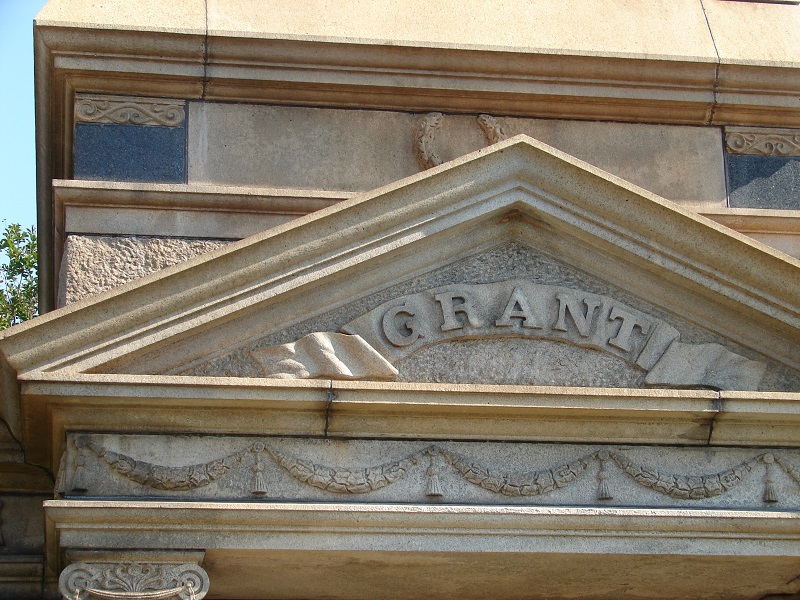 He attended the University of Georgia but opted to drop out to study law. Gordon passed the Georgia Bar in 1854 and began his short-lived career as a lawyer. Later that year Gordon married Rebecca “Fanny” Haralson (9.18.1837-4.28.1931). Abandoning his legal career, Gordon dabbled in various occupations before the Civil War erupted. Gordon was one of the least experienced men to enter the ranks; however, he ended the war as Robert E. Lee’s most trusted soldiers. During the “Battle of Bloody Lane,” Gordon was heavily wounded (five times). Gordon is credited as stating: “Until the sun goes down or victory is won.” His faithful wife, Fanny, nursed him back to health whereupon he quickly returned to service. On May 14, 1864, Gordon was conferred as Major General of the CSA. Fanny was an active member of the Atlanta Ladies’ Memorial Association, a sub-set of the organization credited with locating and burying the Confederate soldiers in proper graves. Gordon is widely believed to have presented the founding documents of the Ku Klux Klan (KKK) and becoming the titular leader (Grand Dragon) at the national convention held in Nashville, Tennessee in April 1867. Gordon became politically active and served as a U.S. Senator (1873-1880, 1891-1897) and Governor (1886-1890). A prominent Democrat, Gordon is honored with a statue at the Georgia Capitol. Gordon died in Miami, Florida, on January, 9, 1904, with Fanny by his side. 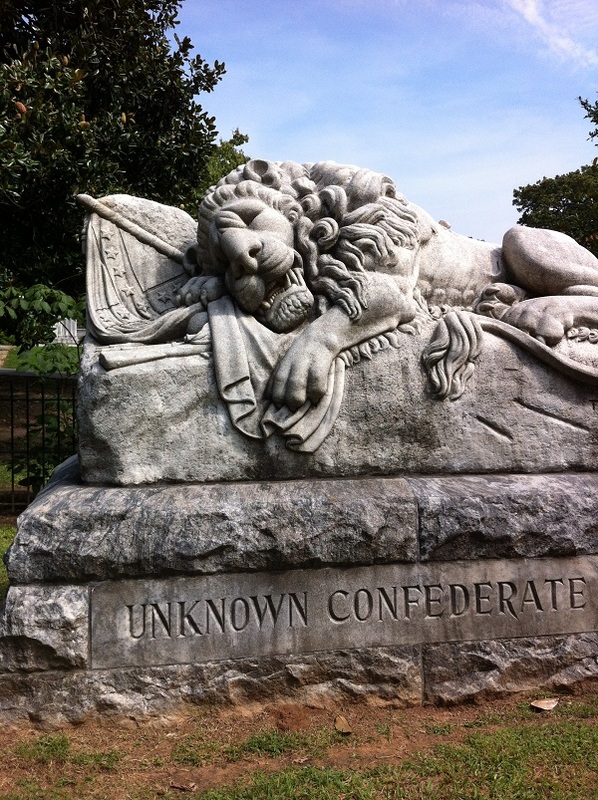 The Confederate Section at the Oakland Cemetery is the principal place in Atlanta for mourning and memorialization of the soldiers who fought in the war. The remains of soldiers came predominately from battles in Peachtree Creek, East Atlanta, Ezra Church, Chickamauga, Lookout Mountain, and Missionary Ridge. Clement Evans was born on February 25, 1833, near Lumpkin in Stewart, County, Georgia. He attended Augusta Law School and passed the Georgia State Bar at the age of 18. By the time he turned 21, Evans was a county judge. At 25, Evans was a State Senator affiliated with the Know-Nothing Party. When the Civil War broke out, Evans resigned from the legislature. Evans organized a militia in 1860 and quickly climbed through the ranks. He was promoted to Brigadier General in May 1864. He was wounded five times during the war. After the war was over, Evans found his true calling as a preacher with the Methodist Church. Evans married his first wife, Mary Allen “Allie” Walton, in 1854. They had eight children; however, three died in infancy. He would marry his second wife, Sarah Avary Evans in 1887 (see previous post). General Evans had a full life where he was a politician, officer, author, historian, and finally a minister. His funeral procession was one of the largest held at that time. In honor of his service to the State of Georgia, the legislature created Evans County in 1914. As you may know, General Evans does not rest beside his wife but is among the other Confederate Generals within Oakland. Nestled beside the “Out in the Rain” fountain, is the unimposing tombstone of Sarah Avary Evans (1842-1902), second wife of Brigadier General Clement A. Evans. Sarah was the daughter of Dr. James Corbin Avary (1818-1873) and Susan Frances Carr (1824-1899). Her first husband died leaving her a young widow. In 1887, Sarah married General Evans. He brought four surviving children to the marriage. Shortly thereafter, they had a daughter, Sarah Lee Evans Lippincott (1889-1972). Sarah was a member of the National Society Daughters of the American Revolution and is listed in the 1911 directory with the member number 83727. Sarah died suddenly. Many were shocked to learn of her death. More tragic is that her husband was not interred beside her. Upon his death in 1911, Gen. Evans was interred in the Confederate Section (see discussion tomorrow). Investigation: During one of the my trips to Oakland, I received the word “dress” while beside Sarah’s tombstone. I have not found any relationship or link between the two. However, I was deeply saddened when I read of her not resting in peace beside her husband. 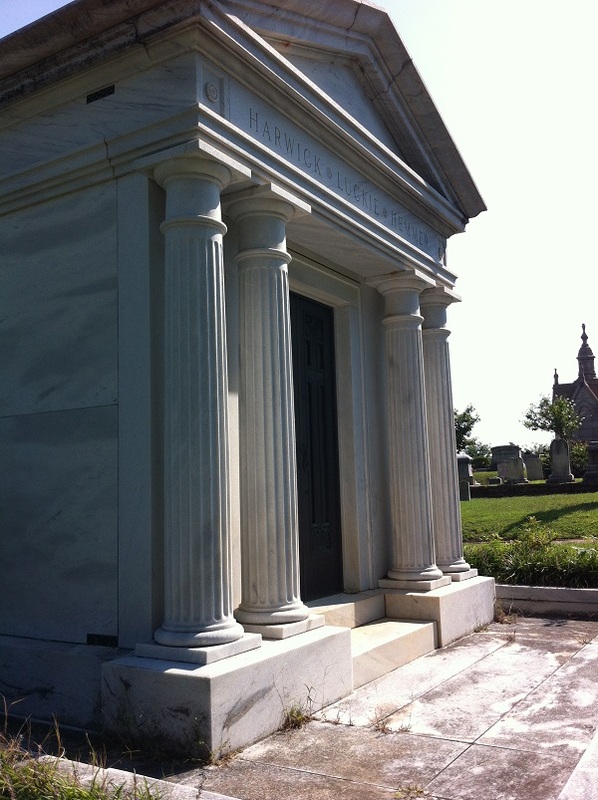 Further, her daughter is not buried in Oakland, but is interred in the West Laurel Hill Cemetery, Pennsylvania. That’s why I wrote about her. 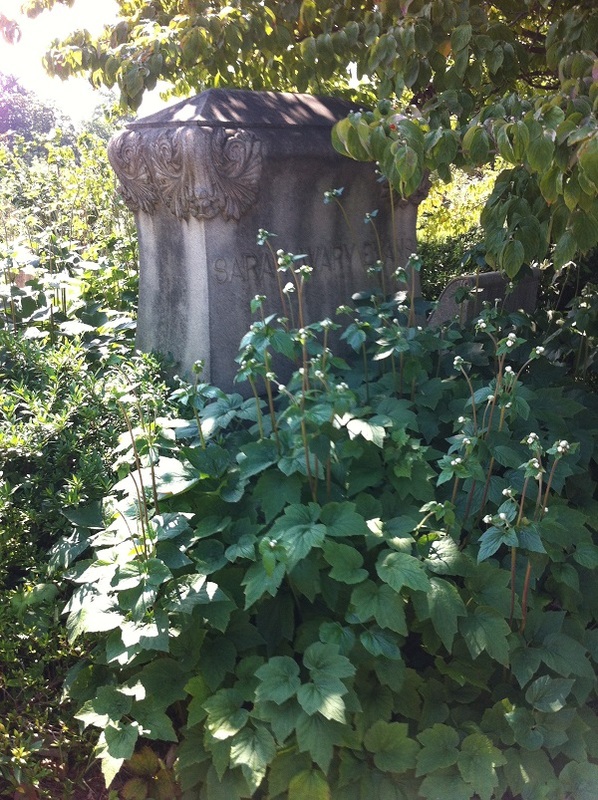 She does have a beautifully landscaped family plot with lots of ivy. Two former Georgia governors are buried underneath the archangel Gabriel. Joseph E. Brown (1821-1894) was the Civil War Governor of Georgia. He served four terms, the only person to do so. Later, he became a U.S. Senator and Chief Justice of the Georgia Supreme Court. His son, Joseph M. Brown (1851-1932) served two terms. 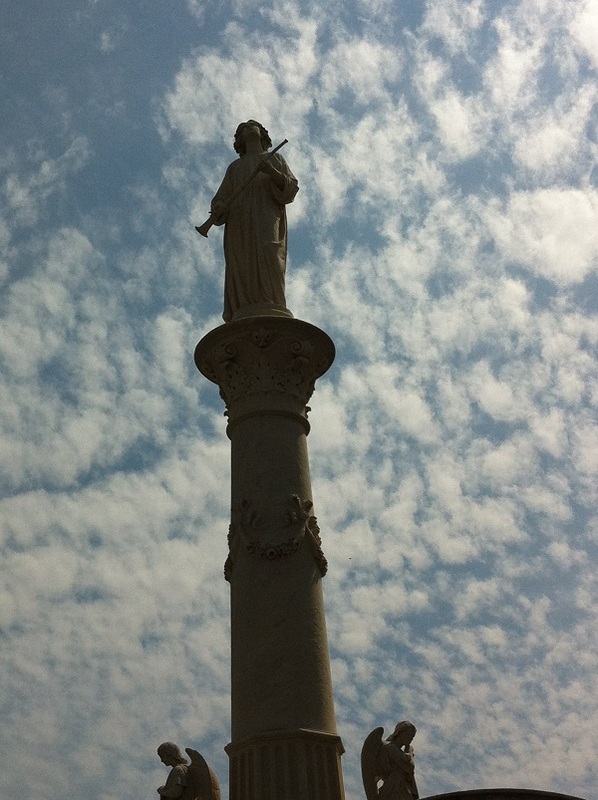 Architecture: The 7′ archangel Gabriel tops the monument. He gazes toward heaven indicating a victory over death. Two additional angels serve as messengers from God. They hold down-turned torches indicating a life snuffed out. 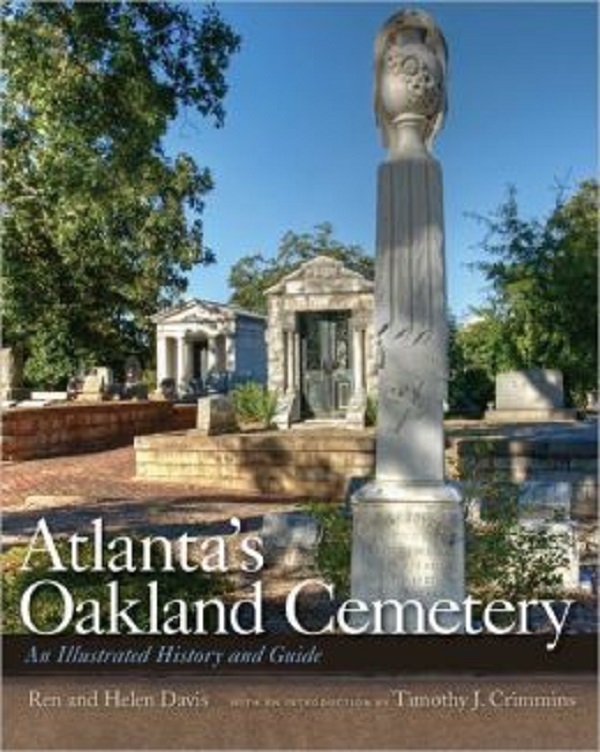 Tragedy Strikes: On a Friday night in March, 2008, Oakland Cemetery suffered significant damage as a tornado swept through downtown Atlanta. The column toppled. Gabriel shattered. Many believed the statue was beyond repair. Amazingly, within seven months preservationists worked diligently and restored Gabriel to his perch. Located in the northwest corner of Oakland, sits the “Knit Mill” section. It is presumably named for the various mills and factories that used to line the area. 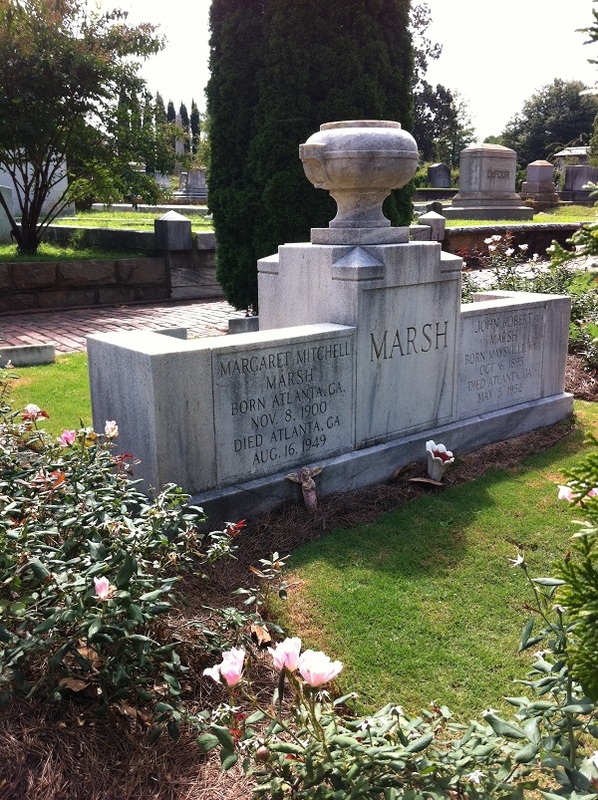 The area’s most notable inhabitant is Margaret Mitchell, author of Gone with the Wind. Margaret Munnerlyn Mitchell Marsh was born November 8, 1900, to Atlanta lawyer, Eugene Muse Mitchell, and suffragist, Mary Isabel “May Belle” Stephens. Mitchell’s paternal grandfather, Russell Mitchell, was a Confederate veteran. Mitchell grew up listening to his Civil War stories, which became the basis for her only novel. While in school, Mitchell took to the nickname “Peggy” or simply “Peg.” She attended one year of college before coming home to tend to the house once her mother succumbed to the Spanish flu. Mitchell married Berrien K. Upshaw in 1922. That marriage ended in an uncontested divorce when Upshaw became abusive. Mitchell then married John Marsh in 1925. They were married up until her death. Unfortunately, they did not have any children. Mitchell’s Southern novel was published in 1936. Mitchell hoped for a 5,000 print run. However, the book sales broke all expectations. The novel garnered Mitchell a National Book Award (1936) and a Pulitzer Prize for Fiction (1937). The book was optioned for a movie for $50,000. In 1939, the motion picture premiered in Atlanta and starred Clark Gable and Vivien Leigh. After 74 years, it continues to celebrate widespread appeal and popularity. Once the movie debuted, Mitchell had no time for writing. It was to be her one and only novel. Tragedy struck on August 16, 1949, when Mitchell and her husband were attempting to cross on Peachtree Street in Atlanta. Mitchell was hit and rendered unconscious. After five days, she died at Grady Hospital at the age of 48. Her gravesite is extremely popular. Follow the yellow directional signs. Every time I visit, there is always someone sitting on the bench. When her publisher was alive, he would have tulips planted annually. William Richard Venable (3.15.1826-9.5-1873) was a pioneer settler and served as the Superior Court Clerk of Fulton County. His sons William Hoyt Venable (4.23.1852-9.1.1905) and Samuel Hoyt Venable (9.27.1856-4.28.1939) purchased Stone Mountain in 1887 for $45,000. The brothers owned and operated the mountain as a granite quarry. Samuel, a confirmed bachelor, lived at 1410 Ponce de Leon Avenue. In 1920, Samuel deeded his half of the mountain to his sister, Elizabeth “Lizzie” Venable Mason (1873-1951). She resided at 1914 Ponce de Leon Avenue. Samuel was associated with the second founding of the Klu Klux Klan (KKK). He granted the organization permission to hold rallies and to burn crosses on the mountain property. Later, Samuel joined other family members in permitting the Daughters of the Confederacy to carve the large relief on the north face of the mountain. After Samuel’s death, the Venable family sold Stone Mountain to the State of Georgia sometimes in the 1950s. 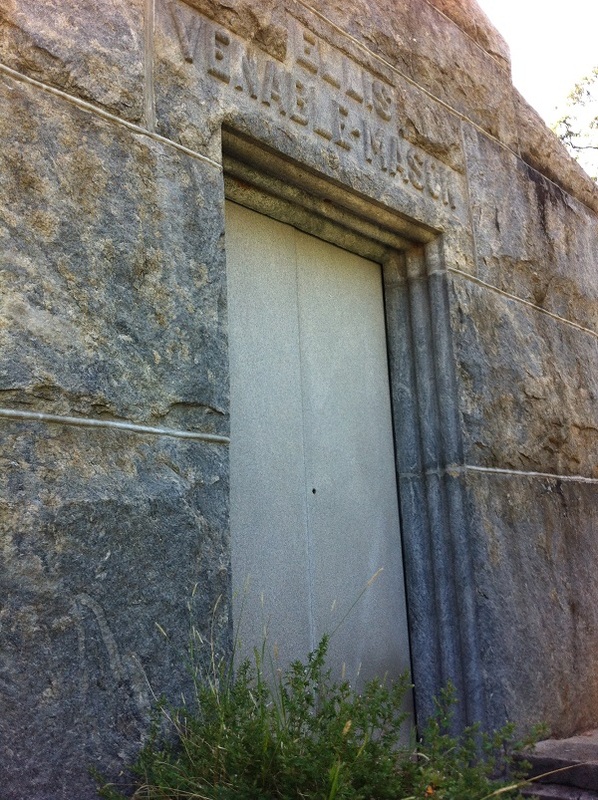 The mausoleum houses the remains of William R. and Samuel.